"I've gotta be the only superstar in the league that's going through what I'm going through right now," Derrick Rose complained on Monday night, incensed about what he saw as a lack of foul calls against players defending him. "But I can't say too much about it." NBA officials may not be giving him his due, but Rose is certainly getting the superstar treatment on the real estate front: The league's MVP has purchased an 84th floor bachelor pad in Chicago's Trump International Tower & Hotel, featuring an unobstructed downtown view, Brazilian walnut hardwood floors and concrete pillars wrapped in a mosaic of iridescent glass tiles. Rose's flat contains three bedrooms, four bathrooms, a den and a professional-level kitchen. The 3,102-square-foot apartment, which takes up half the 84th floor, cost Rose a $1 million down payment and a $1.7 million mortgage with Northern Trust. No. 1 can certainly afford it: The star point guard just signed a $260 million "lifetime" contract with Adidas, on top of a $95 million contract extension with the Bulls. "Man, it's definitely a blessing," said Rose, 23, about the 14-year Adidas deal. "Of course we've been trying to get it out of the way for a long time. I just remember them bringing it up to me and I couldn't really think about the amount. It was crazy. I'm just blessed and feel grateful." 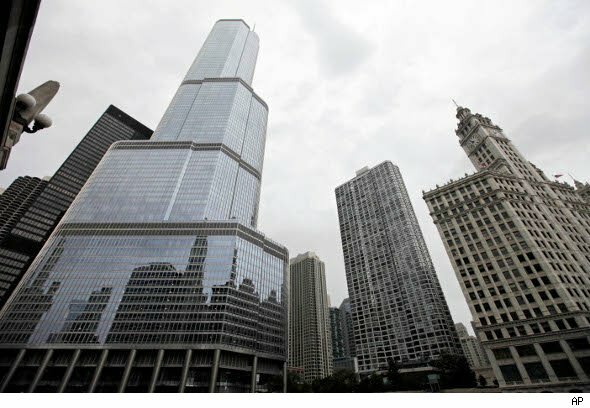 Adding to D-Rose's embarrassment of riches will be the fine amenities of the Trump Tower. His condo comes with two parking spots, as well as pool and gym access. The master bathroom is lined in limestone and features double sinks, double showers and a deep Jacuzzi. Rose can call on gourmet room service, a constantly on-duty concierge and daily cleaning services -- all for a mere $2,700 monthly assessment. "It's definitely an unbelievable feeling just being up there," Rose said about his new skyscraper digs. "The view is nice and I don't take it for granted. It's a blessing." "He got one of the top four units in the building," said Andrew Glatz, president of Chicago brokerage Crown Heights Realty and an agent who has worked with Trump Tower. "For a guy who's 23 and living a bachelor life, I can't imagine a better bachelor pad." 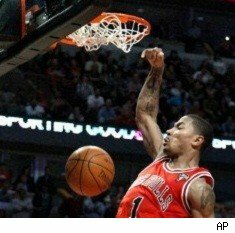 Rose said that he hopes to move in before the end of this season. He is waiting for furniture to arrive before he moves out of his current residence, in north suburban Northbrook. When the Nationals -- formerly the Montreal Expos -- came to the city in 2005, the capital finally had a team for all four major sports. The Nationals have yet to have a winning record. Two of the city's other three teams, the NFL's Redskins and the NBA's Wizards, have only had moderate success, making their leagues' playoffs a combined six times over the past decade. However, the city's fourth team, the NHL's Washington Capitals, has been a bright spot for the D.C. area. The Caps started the 2000s poorly, but a series of bad years led to high draft picks and star talent. The most notable of these was first-round pick Alex Ovechkin, whose exciting play has led the team to four straight playoff runs and re-energized the city as a hockey town. Since the Twin Cities gained the NHL's Minnesota Wild in 2000, they have had a team representing each of the four major sports. The Wild have been average since they entered the league, have made the playoffs three times, and are in the hunt for a spot this year. In basketball, the Minnesota Timberwolves had a good streak between the 1990s and the early 2000s, but have been a weak team the last few years. The Minnesota Vikings have been above-average -- at least second in their NFL division in 10 of the last fourteen years. But this season was tough for the Vikings, who are still trying to find a consistent quarterback to compliment star running back Adrian Peterson. MLB's Minnesota Twins have had above .500 seasons all but twice in the past 10 years, and made the playoffs six times during that period. The Mile-High City doesn't have a single major championship to show for the past decade, but not for a lack of exciting or competitive teams. Since the NHL's Colorado Avalanche won the Stanley Cup back in 2001, the team's record has been spotty. The other three clubs, however, have fared better. The NBA's Denver Nuggets, which have made the playoffs eight years straight, seem to be on the verge of winning a championship every year. The Rockies haven't been stellar in the past decade, but did make baseball's playoffs twice in the past five years, including a World Series loss to Boston. Finally, the Broncos made the NFL playoffs three years in a row in the early part of the decade, and then fell out of contention as they searched for a solid quarterback. They seem to have found one in Tim Tebow, one of the most exciting young signal-callers in recent memory. Tebow, with the entire sports media looking over his shoulder, led the team into the playoffs season. While Detroit's economic troubles have made the city a hard place to live for many, being a sports fan there has definitely been easier. All of the city's teams had exciting moments in the past decade. The Detroit Lions were the late bloomer to this field. The Lions were a horrible NFL team through most of the last decade, including an 0-16 season in 2008. But with quarterback Matt Stafford, star receiver Calvin Johnson, and a solid defense coming into its own, they have turned things around. This year, the Lions made the playoffs for the first time in 13 years, and finished second in the NFC North to the Green Bay Packers. In baseball, the Tigers generally have been a winning team since 2005. They have made the ALCS twice and the World Series once during that time. The Pistons have been on the outs the last couple of years, but made the playoffs eight years in a row before that, including winning the championship over the Los Angeles Lakers in 2004. First and foremost, however, Detroit is Hockeytown. The Red Wings, which have won more Stanley Cups than any American team, made the finals three times in the last decade and won twice. If it weren't for the fact that the Mavericks won the NBA championship last year, Dallas would be without a single major title since the Stars won the Stanley Cup in 1999. Like Denver, perpetual failure to seal the deal does not mean The Big D doesn't have its share of quality and exciting teams. The Stars haven't reached the NHL playoffs in three years, but did so in the previous five seasons. The Cowboys have been below-par the past few years, but have made the NFL playoffs four times since the 2003 season. The Mavericks have been one of the best teams in basketball over the past 10 years, with the second-best overall record in that time. The team also has made the playoffs 11 straight years going back to the 2000-2001 season. And in baseball, the Rangers have made it to the World Series two years in a row. Philadelphia is yet another city with no shortage of excellent teams that just haven't been particularly successful in the playoffs. Over the past 10 years, each of the city's four major sports clubs ranked among the top 15 teams in their respective leagues. While the least successful team -- the NBA's 76ers -- has room for improvement, it has made the playoffs six times in the last 10 seasons. The Phillies have been in the playoffs the last five years running, and in that space made back-to-back appearances in the World Series, winning the first one. The Eagles have made the playoffs nine times in the past 12 seasons, including losing the 2004 Super Bowl to the New England Patriots. The NHL's Flyers have missed just two playoffs since 1995, and have been to two cup finals. Los Angeles loses substantial points in our ranking for being the second most populous city in the U.S. and still failing to host a team in the most popular sport in the country. Los Angeles has tried to bring a NFL team to the city many times since the Raiders went back to Oakland in 1995, but without success. The city makes it up to its die-hard sports fans by hosting six sports teams, most of them among the elite. The lesser of the two basketball teams, the Clippers, has been mostly awful the past few decades, but the Lakers have won five NBA championships in the past 13 seasons. In hockey, the Anaheim Ducks won the Stanley Cup in 2007 and the L.A. Kings have improved in the past few seasons. Finally, in baseball, the Dodgers and Angels have made the playoffs 10 times between them in the past 10 seasons, including a World Series win by the Angels in 2002. Chicago may not have the kind of record the Boston teams do, but in terms of sports' popularity in the city, Chicago ranks high. Sporting events have been revitalized in the city in the past decade, with attendance increasing substantially for every team but baseball's White Sox. And stadium attendance in the city is among the best in each sport. The NHL's Blackhawks, for example, sold well above stadium capacity last year, as did the NBA's Bulls. Each of its teams has been to the playoffs in the past decade, with the White Sox winning the World Series in 2005 and the Blackhawks winning the Stanley Cup in 2009. No city has won more championships than Boston in the last decade. Each of the four major teams in the region has won the top title for its league in the past seven years. Over the past 10 years, each of the teams has at least the sixth-best record for their sport. The Red Sox have the second-best record in baseball over that time, and the Patriots have the best NFL record over that time. When it comes to championships, the Bruins won the Stanley Cup last year, the NBA's Celtics won in 2008, and the Red Sox won the World Series twice earlier in the decade. The Patriots, meanwhile have been to the Super Bowl a ridiculous four times out of the past 10, winning three. They are set to make their fifth appearance in the past eleven years when they play New York's Giants in Indianapolis this weekend. For a city hosting nine separate teams within its metropolitan region, it's amazing that only three of them have won championships in the past 10 years. The New Jersey Devils (Newark is part of the New York metropolitan area) won the Stanley Cup in 2003. The Giants won the Super Bowl in 2008, and the Yankees won the World Series in 2009. However, with such selection, there is a team in New York for any kind of sports fan. For those perpetually rooting for the underdog, the Islanders in hockey, the Mets in baseball, and the Nets in basketball have struggled for years. For those who love winning teams, the Yankees have missed the playoffs just once since the 1994 baseball strike. And at least one of the city's two football teams has made the playoffs since 2003. The city's disappointing basketball team, the Knicks, seem to be finally improving again. The Rangers have been solid for most of the decade, and are currently dominating the Eastern Conference in the NHL. Of course, the Giants are currently on their way to a Super Bowl rematch with the New England Patriots.